Pianos, Elevators and Stairs, Oh My! 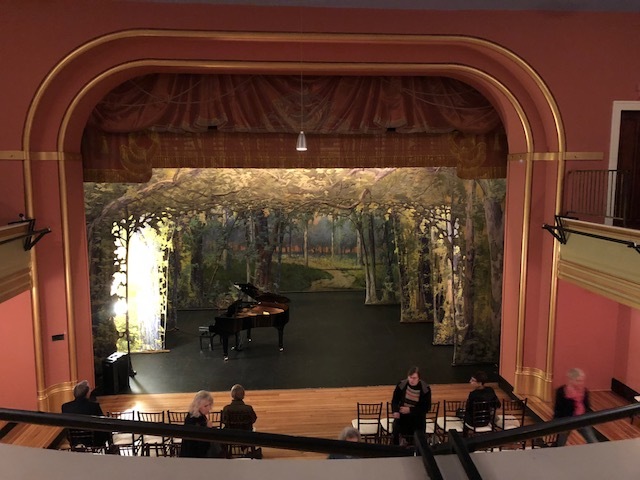 The Asheville Lyric Opera presented their “Fall in Love” concert in the beautiful fourth floor theatre of the historic 1913 Asheville Masonic Temple. 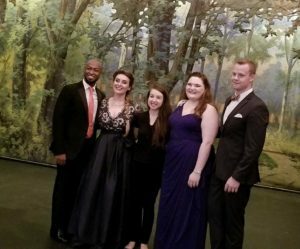 The event was our first opportunity to work with the great people of the Lyric Opera and to attend one of their excellent concerts. We thoroughly enjoyed the performance of operatic and other love songs. As you might imagine, providing pianos for events often creates special challenges for our moving team. As I mentioned, the theatre was on the fourth floor. True, there was an elevator and it worked; but there were a few extenuating circumstances. First, the elevator was the original 1924 Otis elevator which limited the piano size to 5 feet or less. Secondly, there was a small flight of stairs to ascend after the piano was unloaded from the elevator. The ramp which was required for those stairs did not fit in the elevator so our team carried the 12’ 300 pound ramp up and down three extra-long flights of stairs with several turns — four times! Which of our pianos made this exciting trip? A 5’ G Steinberg baby grand was selected from our showroom for the adventure. You haven’t heard of a Steinberg? Levi and I were introduced to Steinberg pianos when we were in Amsterdam a few years ago. They are a sister company to our very popular Perzina pianos. Not only was the Steinberg the perfect size for the elevator, its “large tone in a small package” blended beautifully with the vocalists making the concert a great success.